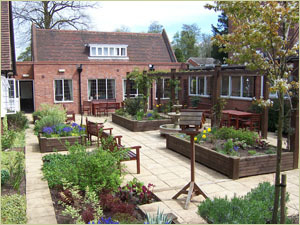 The Spinney which opened in 2003, is a safe, self-contained unit catering for older people with mental health needs. The unit has 9 bedrooms and 8 have en-suite facilities. The spacious lounge and activity room has French doors opening on to an attractive, enclosed courtyard garden. The environment is warm and friendly. Staff continually promote dignity, respect and supervised independence. The NVQ qualified staff are well established and are trained to care for residents with dementia. Residents’ days are not structured by routine, but are flexible. Breakfast is prepared within the unit and served as residents get up. Main meals are planned to meet individual needs and are prepared in the main house kitchen. The unit has an open house policy, encouraging families and friends to remain actively involved in residents’ lives. They may stay for a meal or spend the day. Daily activities are organised within the unit. Residents are encouraged to attend regular entertainments in the main house and to join in excursions. All activities are meaningful and age related.